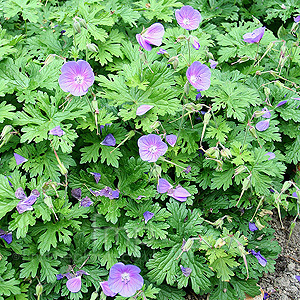 Cultivation tips: The tough and versatile Geranium makes an ideal front of border flowering plant that both covers ground and produced prodicious quantities of blossom. flourishing in most garden soils other than heavy wet and very droughty soils. Most prefer full or part sun in a sheltered position. Cut back growth to ground in Autumn and mulch with 2 - 3 inches of compost every few years. Ideally plant in groups of 3-5 or on mass as herbaceous ground cover.